Originally published in 1951, The Sea Around Us is one of the most influential books ever written about the natural world. Rachel Carson's ability to combine scientific insight with poetic prose catapulted her book to the top of The New York Times best-seller list, where it remained for more than a year and a half. Ultimately it sold well over a million copies, was translated into 28 languages, inspired an Academy Award-winning documentary, and won both the National Book Award and the John Burroughs Medal. The Sea Around Us remains as fresh today as when it first appeared over six decades ago. Carson's genius for evoking the power and primacy of the world's bodies of water, combining the cosmic and the intimate, remains almost unmatched: the newly formed Earth cooling beneath an endlessly overcast sky; the centuries of nonstop rain that created the oceans; giant squids battling sperm whales hundreds of fathoms below the surface; the power of the tides moving 100 billion tons of water daily in one bay alone; the seismic waves known as tsunamis that periodically remind us of the oceans' overwhelmingly destructive power. The seas sustain human life and imperil it. 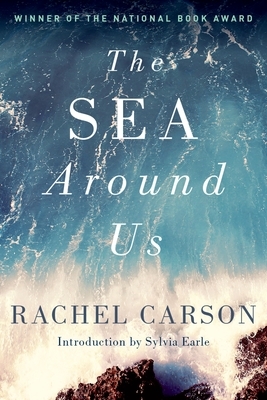 Today, with the oceans endangered by the dumping of medical waste and ecological disasters such as the Exxon oil spill in Alaska, the gradual death of the Great Barrier Reef, and the melting of the polar ice caps, Carson's book provides a timely reminder of both the fragility and the centrality of the ocean and the life that abounds within it. Anyone who loves the sea, or who is concerned about our natural environment, will want to read, or re-read, this classic work. The late Rachel Carson was for many years a marine biologist and then editor-in-chief of the United States Fish and Wildlife Service. She was also the author of Silent Spring, Under the Sea-Wind, and At the Edge of the Sea. Sylvia Earle is a marine biologist, oceanographer, and National Geographic Society Explorer in Residence. Her books include Blue Hope: Exploring and Caring for Earth's Magnificent Ocean and Ocean: An Illustrated Atlas.